The arrests were made yesterday after gardaí and protesters clashed in the Christchurch area of Dublin city. 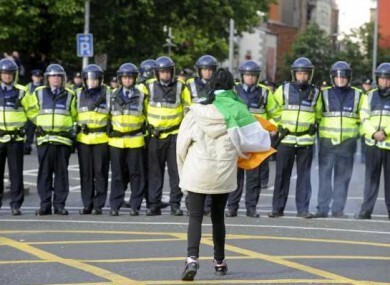 A protesters confronts gardaí at Christchurch in Dublin yesterday. EIGHT MEN were arrested in the Christchurch area of Dublin yesterday as people protesting against the royal visit clashed with gardaí. The hundreds of people involved in yesterday’s protests included members of the Éirígí and 32 County Sovereignty movement. The protests took place as Queen Elizabeth attended a special function at Dublin Castle hosted by President Mary McAleese. Gardaí said this morning that all eight were released without charge. Today, traffic on parts of the N4 and M50 and Dublin city centre will be disrupted due to the royal visit. The Queen travels to the National Stud in Kildare today. The Duke of Edinburgh is staying in Dublin for an event at the Áras and, later this evening, both will attend an event at the National Convention Centre in Dublin. Email “Eight men arrested over royal visit protests”. Feedback on “Eight men arrested over royal visit protests”.